While the climate of Antarctica is extremely harsh and difficult to work in, it is an ideal place to conduct astronomy. The fact that the continent is cold, dry and far from any major sources of pollution make for clear atmospheric conditions. And due to its months-long polar days and nights, one can observe the long-term variation in the Sun during the austral summer and in the stars during the austral winter without the interruption of day changing to night and back again. Astronomical observations have been going on in Antarctica since Martin A. Pomerantz Observatory at the American Amundsen-Scott Base at the South Pole was constructed in the late 1970s. However there are even more appropriate places in Antarctica to make astronomical observations, especially on the Antarctic Plateau, where low wind speeds make for smooth airflow near the ground, reducing the turbulent layer of the atmosphere, making for clearer observations than at other places on the planet, including at the South Pole. Due to its high altitude (between 3 and 4 km above sea level), the Antarctic Plateau has one of the harshest climates on Earth. With average temperatures not rising above -20°C in the summer and often dropping below -80°C in the winter, this part of Antarctica is one of the most challenging environments to travel and work in on the continent, if not the planet. Yet the benefits of doing astronomical observations there are well worth the trouble. The special atmospheric conditions make it a more ideal place for astronomical observations, particularly in the thermal infrared, sub-millimetre (terahertz), and millimetre-wave regions of the electromagnetic spectrum. Moreover, the clarity of observations that can be made at certain places on the Antarctic Plateau can even approach the same quality of images taken from space with instruments like the Hubble Space Telescope, making it possible to have images of excellent quality at a much lower cost. 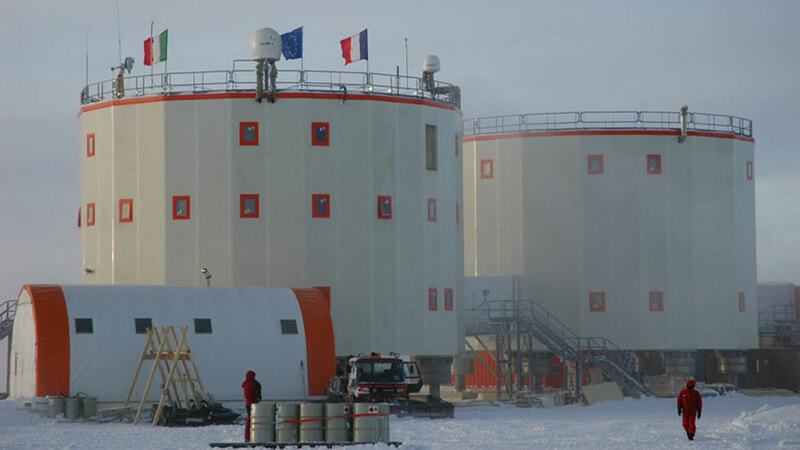 Along with the Chinese at Dome A and the Japanese at Dome F, the French and Italians have been investigating astronomical observation projects at Concordia Station at Dome C on the Antarctic Plateau in an EC-funded action called ARENA (Antarctic Research, a European Network for Astrophysics). The project is a consortium of 22 European and Australian partners including polar institutes, research laboratories and industrial companies. To gather existing atmospheric observations important for determining astronomical observation conditions and putting this information into internet-accessible databases accessible to the entire scientific community in order to consolidate what scientists know about the atmosphere. From this information it will be possible to derive important parameters such as those related to turbulence and atmospheric transmission, sky emissions, etc. Several laboratories in Italy, France and Australia coordinated their efforts in collecting the data. To devise a suite of programmes to take advantage of the ideal observational conditions at DOME C. There’s no reason to conduct astronomical observations in one of the harshest parts of the planet unless there are clear benefits, so an assessment of possible research projects had to be done as a first step. ARENA released its conclusions and recommendations in December 2009. In addition to the unique benefits that being located in Antarctica offers, Dome C is a very ideal place to make observations since the atmosphere has a very low turbulent ground layer (TGL). Having telescopes that can reach above the TGL means having access to great conditions for making observations and obtaining higher resolution images. The turbulent layer at Dome C is only 20-30 metres; at other observatories on the planet, the turbulent layer can be a few hundred metres high. This means it’s only necessary to construct telescopes tens of metres high at Dome C to rise above the turbulent layer and make clear observations or even use simple Adaptive Optics techniques (a technology used to improve the performance of optical systems by reducing the effects of rapidly changing optical distortion) to alleviate the effect of the atmospheric turbulence. Sky background emission, which is a major drawback in the thermal infrared part of the spectrum, is also much lower than at other observatories in the mid-latitudes and the tropics. Conducting wide-field, deep, synoptic surveys in the thermal part of the infrared spectrum with a proposed 2.5-metre class telescope at Dome C called the Polar Large Telescope (PLT). This telescope would investigate the distant universe and the first generations of stars as well as characterize regions of star formation and exoplanets in a still barely explored spectral range. Assessing the possibility of making observations in the sub-millimetre wavelength range (between 200 and 500 µm, in the TeraHertz regime), which is much better than anywhere else on Earth, even better than the ALMA Observatory in the Chilean Andes. There has been a proposal to construct a 25-metre class sub-millimetre telescope at Dome C to do just this. Examining possibilities for making observations in the visible part of the spectrum. This is particularly interesting for observing tiny details, such as the presence of exo-Earths (planets like Earth outside our Solar System) around other stars using interferometry (deriving the fine spatial structure of an object from the interference pattern produced by the superimposition of beams coming from an array of two or more telescopes). The interferometers currently set up around the world such as the European Southern Observatory’s Very Large Telescope Interferometer (VLTI) array at La Silla, Chile has a resolving power that is not large enough to detect exo-Earths. However having a larger kilometric interferometer in Antarctica would be ideal, so ARENA investigated the possibility of constructing one at Dome C.
Setting up instruments to conduct long-term photometric observations. Several instruments have already been set up at Dome C, including the ASTEP instrument, which is a 40 cm telescope used to monitor planetary transits. Made at the Fizeau Laboratory in Nice and installed during the 2009-10 austral summer, the ASTEP instrument will start making observations during the 2010 austral winter. An Italian infrared telescope called IRAIT (International (formerly) Italian Robotic Antarctic Infrared Telescope) will also be installed. At 80 cm it will be the largest optical/infrared telescope ever installed in Antarctica. It will be used to conduct surveys and observations of bright objects in the thermal IR range such as the evolved Asymptotic Giant Branch (AGB) stars (which includes carbon stars that are losing a lot of mass and provide the interstellar medium with the material from which the next generation of stars will form). Doing cosmic microwave background (CMB) measurements (looking at CMB polarization, for example) can provide valuable information on the initial expansion of the universe, dark matter and dark energy. These are topics astronomers are interested investigating at every opportunity. CMB observations have been going on at Amundsen-Scott Station at the South Pole for the last 20 years, but Dome C’s location makes it a more ideal place to make such observations. Investigating the possibility of eventually conducting observations of the solar corona and chromosphere. Many astronomers are interested in studying fine-scale structures of the sun from DOME C thanks to the coronographic sky and the good observing conditions. A proposal has been made to build a coronograhic interferometer. While the assessment phase is essentially over and continuous monitoring is needed, getting down to making some serious observations will be the next step forward. Many of the projects proposed are currently only at the proposal stage (constructing a kilometric interferometer at Dome C, for example, is a long way from being realized at the moment) although a few observations have already begun. Dr. Epchtein from the Hippolyte Fizeau Laboratory of the CNRS at the University of Nice talks about current and planned observations in an interview conducted with Sciencepoles. The clarity of observations made at certain places on the Antarctic Plateau can approach the same quality of images from space.